In the latest issue of International Maritime and Port Security magazine I had the pleasure of cover the thriving diesel-electric (SSK) submarine industry. Editor, Richard Thomas, investigated this sector previously in the subsea warfare market report and found a sector experiencing a relative boom time, even in regions (such as Europe) that are experiencing a general contraction in naval significance and industrial output. A series of SSK programmes in Germany, Sweden, Italy and Norway is keeping that region active for both operator and industry alike. In Asia requirements for India and Pakistan attract significant interest and industrial cooperation inside those countries, while Asia-Pacific rivals also seek to expand their subsurface fleets in a continual game of defence one-upmanship. A Swedish Gotland Class submarine currently going through mid-life upgrades with Saab. China is emerging as a defence influencer in the region having agreed a series of submarine procurement programmes with neighbours, while Japan and South Korea try to challenge this with their own domestic and international efforts. We introduce submarines then into this magazine in recognition of the role that smaller SSKs play in maintaining security in the EEZs and littorals, conducting special operations against target coastlines or surveillance missions to gather valuable intelligence. The industry supporting the demand is global, with boat builders from West to East all pursuing rich contracts and new markets. Indeed, SSKs are perhaps one of the most adaptable and effective platforms that a navy can operate, particularly because most of the time potential rivals don’t know they are being surveilled in the first place. The U-32 is the second Type 212A submarine used by the German Navy. Technology in propulsion and battery technology is pushing back against one of the limiting factors that SSKs have to contend with – the need to surface and run its diesels to recharge capacitors. The boats fitted with such capabilities can now stay underwater for significantly greater periods of time and maximising their use to the fleet. As the UK awaits the arrival of the Queen Elizabeth at its new home in Portsmouth it was reported over the weekend that a hobbyist drone landed on the deck on the £3 billion vessel. If it were not for the Royal Navy’s (RN) Merlin helicopters landing on its deck during sea trials this could have been an embarrassing first deck landing on the carrier. The Ministry of Defence (MoD) has said it is investigating the incident which took place during sea trials. But it raises the question about how secure the carrier is at present against small unmanned threats. Media reports contradicted themselves with some stating the system used was a DJI Phantom, while others said it was a Parrot Bebop. The US military recently ordered personnel to cease using UAS from Chinese manufacturer DJI on account of possible security threats. In April the FAA restricted drone operations across 133 military facilities, addressing national security concerns regarding unauthorised used of UAVs. DJI’s Phantom 4 quadcopter, widely used by hobbyists. Transferring this type of restriction to the maritime environment is likely to throw up issues but these examples highlight how the US is getting serious about commercial drones in the military environment and the threat they pose. Also, as we recently discussed here on Quill, non-state actors are starting to seriously use unmanned vehicles with a range of payloads, predominantly ‘dumb’ munitions. So is this a recipe for disaster for the RN’s newest and most expensive vessel? Well of course the MoD will now be investigating the incident and is reviewing the security of the vessel. Also it should be noted that the vessel is not fully operational yet and does not have its full crew on board. One would hope during operations the story would be somewhat different. This is not the first incident of drones getting close to maritime assets. Earlier in August it was reported that an Iranian drone flew close to a USN F-18 as as it prepared to land on the nearby US carrier in the Persian Gulf. Would it be out of the question for maritime adversaries to interfere with RN ships using small drones? All very hypothetical but not to be dismissed. 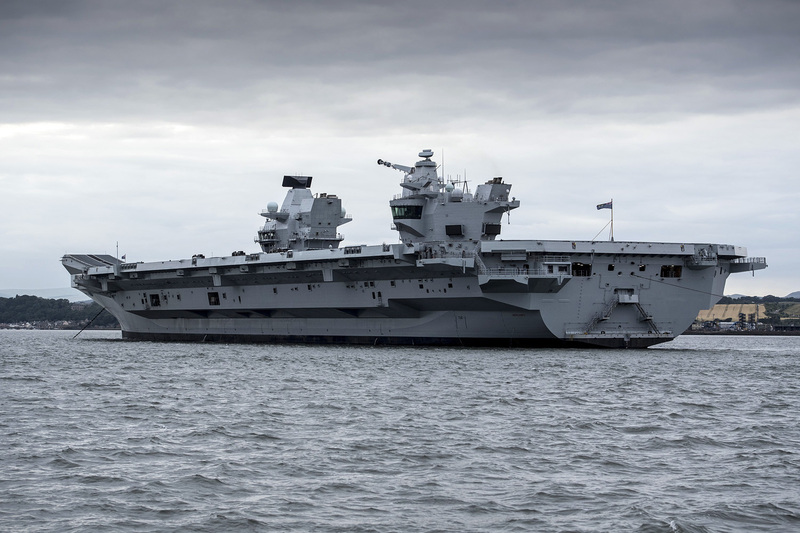 The UK’s Royal Navy is patiently awaiting the arrival of the Queen Elizabeth-class (QEC) carrier at its new home in Portsmouth in the coming weeks. On Monday I visited Her Majesty’s Naval Base (HMNB) Portsmouth to find out more about some of the other class of ships based there, the Type 23 and 45, but I also got a glimpse at some of the impressive infrastructure at the base which will support QEC. Navigation aids have been installed to guide the 280m vessel into the port. There is also an onshore power generation source which will keep the vessel running while it is docked and an airport-style arrivals hall to support the 500-plus contractors which will be coming and going from the carrier each day when in Portsmouth. Meanwhile, on 1 August, it was announced that £3 million was to be saved on the QEC as part of a new deal to supply the RN with more than 10,000 different types of consumable items – covering everything from fittings and fixtures to pistons and pumps. It ought to be noted that maintenance of such a vessel is no mean feat, Babcock currently has a contract to do so. While I was at HMNB I spoke with BAE Systems about some of its experiences maintaining the RN’s Type 45 and Type 23 fleets. The Type 45 has notably been making headlines with various issues with its propulsion systems and at one time all six were seen to be alongside or in dock at one time. BAE Systems has said that one of the lessons learned from its support of the Type 45 programme is the need to have spares readily available. Additionally, there was supposed to be one serious mid-life upgrade but a continuous engineering philosophy was adopted with a lot of the maintenance to be done during fleet time under the original BAE Systems contract. That was the concept as it evolved over a decade ago, according to BAE Systems. The reality has been that the ships staff have been required to do much more than operate and maintain only – something the enterprise should have thought about beforehand, BAE admitted. A single mid-life upgrade just did not work and capability insertion has been a continuous feature for the Type 45s. An ongoing effort, Project Napier, is also being carried out to enhance the vessel’s power and propulsion systems. The Type 45s are now moving to a common support model which will see DE&S take over more of the maintenance, supported by BAE Systems. Design, maintenance and equipment management will return to DE&S and the QEC will follow this model from the outset. The company is already working with teams to implement this support model on the future Type 26s and it has been implemented on the Type 23s. With new vessels coming into service it is imperative that the RN looks closely at both the successes and failings of previous projects. More on this, lessons learned and future plans for maintenance can be found on the Shephard Media website.